This weekend, our family attended a church down the street. Free gifts of appreciation for church visitors. A partially functioning website that had the service times on the homepage. But they failed anyway. We had no interest in returning. Right hospitality practices, but failure way. We were out-of-town visitors looking for a church to join in Sunday celebrations. Our family was not part of this denomination, and not a part of this local community. This was our first time ever in this building. This was our first time ever in that particular denomination. We went uninvited, with no pre-existing social connections, invitations, or even a friend. In other words, we knew no one and nothing about the church. We were a blank slate. How Did We Find the Church? The church is located on the only main road to my parents house, who live about 5 miles off the main highway. We have driven by this church (not the one pictured) each time we make a family visit. This weekend was our first chance to go.We looked up the church’s website in Google. Searching for the church name, it came up first. Clicking around the pages to learn about who and what this church is about, we saw only 1 picture of the people congregation. The rest was text. Sometimes the wording was way over the top and flowery, full of Christian lingo about contemporary hymns and responding in worship. Some of the links were broken, but at least the service time and directions were on the home page. At least that question was answered. On a beautiful Sunday morning, we approached the simple and beautiful church building and entered the parking lot. We didn’t know where the front door was (it wasn’t facing the only parking lot entrance). We did find that they had spaces marked for visitors — they were all empty. We chose to park with the normal people, even though we were visitors. Most of the cars were parked towards the rear of the building. The church campus was clean and landscaped well. There didn’t appear to be any signage indicating where the front door was. Since we arrived at the same time other people did, we watched where people went to enter the building. An usher held the door open for us, and politely shook our hand. He even volunteered his name, which prompted both of us to offer ours. We entered the main lobby (some people still call it a narthex). Here I noticed my emotions were stirring– we were in a crowded room, not knowing where to go, not knowing a soul. People were around us talking, smiling, and greeting each other, but we were feeling a little insecure in a strange crowded space. We had no bearing on the physical space, no map in our head of where everything was. Anxiety? I glanced around and noticed a table. The sign said visitor table, but no person standing around it. What were we supposed to do? We ignored it. We found our way to the sanctuary. An usher gave us a program, but we had to interrupt her conversation with other people in order to get one. We eventually found our own seats, wondering if we were sitting in someone else’s seat. People filed in and out, greeting each other with smiles and conversation, along with the “How’s your wife, how’s aunt Suzy doing?” type small talk. People sat in front of us, and actually talked to the people behind us. Even though I’ve been a visitor in many services, I found that I was disconnected from this one. The music quality was good, but the songs and tunes were unfamiliar. Rich in their theology, and probably very accurate in this theological tradition, we didn’t connect. They were very wordy with theological vocabulary that I haven’t used since seminary. I knew where the visitor table was, because I had seen it, but no one was there. The benediction was given, and church dismissed. We exited the sanctuary in an orderly process with the crowd. In the lobby, coffee was served. We stood around a few minutes, observing people talking and laughing and carrying on. My wife browsed the ministry board that had the fliers on all the ministries of the church. We eventually left, since no one was talking to us, or perhaps even noticing that we exist. They were all engaged in their own friendly conversations. I don’t even recall eye contact with people. The social circles in this church seem really strong. In fact, it seems like it would take an extrovert to put himself or herself out there to break into those social circles and feel a sense of home. We left feeling like we’d never fit into that church. They said 2x that they were glad we visitors were here, but made no effort to notice us. The people around us talked around us. My wife said, “I find it nice when the pastor or leader says, Take a moment and say hello to someone you haven’t met yet.” That can at least allow us to briefly feel welcome, even if its a cursory greeting. Perhaps this church’s philosophy is to ignore the visitor or let the visitor remain totally anonymous until the visitor makes themselves known in some way, like parking in the visitor spot, or visiting the visitor table. There is no one in that church that noticed we were first time visitors. The church administration or ministry team have no idea that we were even there. We left as anonymous as we arrived. This church lacked any kind of relational warmth. While they had all the right systems, I believe they had failed to catch the vision of receiving every guest that would be in their midst. The church leadership team would need to start at square 1: Casting a Vision for Hospitality. 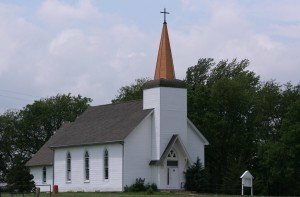 From the inattentive greeters, to the failed passing of the peace, to the lack of any conversation in the 10 minute after the service, it was clear this church lacked a vision for welcoming the visitors. Casting the vision is where this one needs to start. Then I’d show them all the articles I’ve put together in this tutorial on church hospitality. Did you notice the 1st time visitor in your church last weekend? What steps did you take to help them feel welcome? Is Your Church's Hospitality Ministry stuck? Excellent article! I have been a first time visitor, and can relate to people “talking around us.” Can I repost this article on my site? I’ve enjoyed reading your book and hope to have a review of it sometime in June when I clear out the stack of reviews I need to write. I’ve got some other articles to suggest if you’d like to republish a few of those as wel. My husband and I are Hospitality Ministry Leaders at our church. I appreciate you sharing about the cold first time church visit. My husband and I are always looking for ways to improve our churches hospitality ministry,as well as increase the amunt of return visitors. We have been wondering if the seat location for the first tme visitor has an impact on their worship experience, and the visitors decision to return for a second visit to our chuch. Do you remember where you and your wife were seated during this cold first time church visit? There was no special seating for visitors, so we simply found a space and sat in it. Who knows if we accidentally sat in “someones” space. In all the years of reading and studying the subject, having visitor seating area is overlooked. I don’t recall ever seeing a recommendation or an analysis of the practice. The lack of this information tells me it’s either been overlooked, or simply rejected from the get go. I would frown on the idea – it’s another practice that singles out the first time church guests and potentially embarrasses them unnecessarily. I have experience this same treatment before, I guess the Greeting Ministry need to have some more training. I visted a well known church, they had many thing in place. i was greeted at the door ,lead to my seat, on my way to the seat i asked the ushur if I could sit on the other side of the church. He told me ,” I dont know what church you came from but there is order in this church, and that the seat that he gave me is the seat that I will be sitting in. I was shocked by his attitude. My mind stayed on what he said and not on the sermon. Disapointed ! Do you think delivering food, fruit baskets etc. to first time visitor’s is still acceptable? The newcomer/hospitality is my ministry at Carlsbad Community Church in CA. Thanks for asking. . . I think a decision like that needs to be tested for 6-8 weeks in your local area. In some areas, that would be intrusive. Other areas that would feel pretty appreciated and honored. Make a plan to test it out, and then measure repeat visits and decide if that is a viable follow up plan for your area.